Amazon is quickly justifying my decision to get this Kindle. I've had it for about 10 months, and in the course of that time, I have received enough freebie books to pay for the Kindle several times over, now. 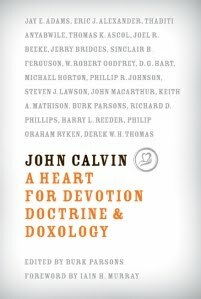 Today, you can get the Kindle edition of John Calvin: A Heart for Devotion, Doctrine, Doxology, edited by Burk Parsons, from Amazon. Just follow this link. [Note: No longer free as of 10/27). John Calvin s name evokes powerful images, most of them negative. In the minds of many, he is perceived as an ivory-tower theologian who was harsh and unreasonable, the driving force behind a dangerous theological system. In this volume, Burk Parsons and eighteen other leading Reformed pastors and scholars authoritatively reveal the truth about Calvin and his teaching that he was humble, caring, pious, Scripture-saturated, and, above all, passionate about upholding the glory of God. Published in conjunction with the five-hundredth anniversary of Calvin s birth (2009), John Calvin: A Heart for Devotion, Doctrine, and Doxology offers a highly readable portrait of a man whose example and teaching remain vitally relevant even in the twenty-first century. 2. Derek W.H. Thomas: Who Was John Calvin? Even when this book wasn't free, it was on my "To Get" list. I recommend that all of you get this book - free or not. Adam- how do you always know about these free kindle books?? If he reviles his sources, you would not have to come to our blog to find all these good things out. There are blogs out there which exclusively tell you about free Kindle books. I'm only interested in the good Reformed ones, however. Fortunately, most of the Christian books they have been giving away are Reformed, which I think is awesome. Just so you know, Amazon has nothing to do with these books being given away for free. It is the sole choice of the publishing requesting that one of there titles be reduced to $0 for a period of time. It is also worth noting that Amazon don't even make this process easy for publishers. This book, for example, is only free because Reformation Trust desires to bless the church. If you'd like them to keep doing this kind of thing, give them a shout out on Twitter or Facebook to let them know how much you appreciate it. Reformation Trust make announcements of their specials and giveaways via their Twitter and Facebook for any of your readers who want to keep up to date. Nathan, I really appreciate you explaining these giveaways. I was offering way too much credit to Amazon.